I recently picked up this Bodum "French Press" style coffee maker and so far, I'm really enjoying it for its simplicity. But I'm curious how I should be grinding my coffee. When I bought it, I grabbed a bag of pre-ground coffee at the grocery store and this worked well. But recently, I bought a can of beans and put it thru the coffee grinder at the store and I may have chose too coarse a grind as I seem to be getting very weak cups of coffee now. The manual said pick a "coarse" grind, so it turned the dial all the way to the left labeled "coarse". I'm thinking it should have been somewhere in the middle, like "Percolate". Any advice on the optimal grind? 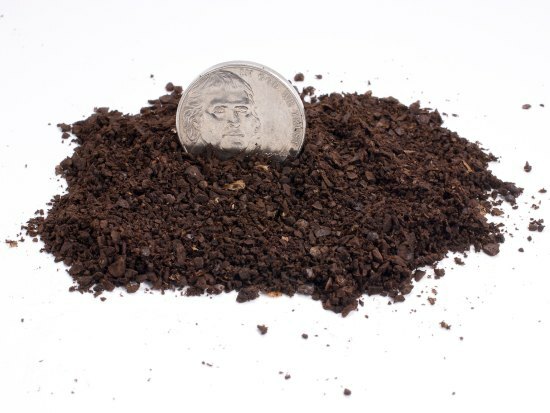 Below is a picture of the coffee chunks in a coarse grind on top of a US 5 cent coin (21.21 mm in diameter). The picture is from this article. EDIT: The reason to use a coarse grind for a french press is that finer grinds will get stuck in the filter and/or push their way through. This has three potential problems: 1) it will be harder to press down the filter, possibly leading to spillage or breakage; 2) your coffee will have grinds in it; 3) the coffee may become bitter, as the finer grinds that passed through the filter remain in contact with the coffee for too long. I've used a French press for many years and use a coarse grind. My grind looks like Kevin Selker's pic above. One thing I do though is to stir the grinds just after adding the water to the French Press before inserting the screen. I have a $10 French press that serves me well. on my grinder, I set the dial right smack down in the middle for medium. I find that my grinder's medium is comparable to the grocery market's Light coarse or even coarse. USE CLEAN, COLD WATER. Brewing with a French Press is simple and easy. You have to know how to do it and WHY you are doing it to extract the most flavor possible. Essentially, your water flavor must be good so you begin by using cold, filtered water. You fill your kettle with TWICE the water needed: half to pre-warm your Press and the other half for brewing. USE THE RIGHT DOSE OF COFFEE BEANS. Dose coffee beans at 55-65g of coffee beans per liter of water, or 70 grams if you "break and clean" (rather than stirring the bloom, you break the bloom foam cake and spoon out the surface grounds to reduce the fines, in which case you sacrifice some brewing grounds, so you need to over-dose a bit). Use a kitchen scale to measure. BEGIN GRINDING THE BEANS JUST BEFORE THE WATER BOILS. Once the bean husk is cracked open favor immediately escapes, so wait until the last minute to grind, just as the water begins to boil. I can recommend Baratza grinders, by the way. BREW AT THE CORRECT TEMPERATURE. As the water almost boils, start your grinder, pre-warm your Press with half the off-boil water, empty the Press and fill with the grounds weighed on a scale. Then pour in the other half of the water, using a scale to measure, at about 205-208 degrees F so as the temperature drops during the brew you are NEVER brewing lower than 195 degrees F. NEVER begin at 195 degrees F or flavor really suffers as the temp at brew's end can even drop to 185 degrees F...not good! BREW FOR THE CORRECT TIME. A four-minute brew cycle is highly recommended. Anything less gives you a raw, under-extracted cup, anything more gives you an over-cooked, over-extracted, bitter cup. At Brew's end, ALWAYS pour out coffee into cups to terminate the brewing. NEVER store coffee in any coffee brewer as it will continue to brew! Even with drip brewing coffee is stored in a carafe...do that same here. A coffee brewer of any kind is NOT a coffee storage carafe. That is a job for a thermally insulated carafe. The insulation in a French Press is there to keep the brew at the correct temperature DURING the brew cycle. FILL KETTLE with at least TWICE the water needed to brew. Use only fresh, never-boiled, COLD, FILTERED water, not the nasty tasting, mildly rusty hot water sitting inside your hot water heater. Now begin heating your water at high heat. WEIGH YOUR BEANS. While the water heats, place your grinder's grounds-collecting bin on your scales, then tare to zero. After weighing, pour the beans into the grinder's hopper, then place the grounds bin in the grinder to catch the grounds when you grind. GRIND YOUR BEANS. Set your grinder to a mid coarse setting, as coarse as coarsely ground pepper, and experiment to get the dosage just right for your taste...I like the finer side of coarse. When your water almost boils, at about 210-211 degrees F, turn off the heat and start your grinder and let the water temp drop a bit in the meantime. WEIGH WATER AS YOU POUR, THEN STEEP. While the grinder is grinding, pour hot water into your Press to warm it. When the grinding is completed, pour the warming water from the Press into your cup(s) to pre-warm them, discard remaining water from the Press. Then pour your coffee grounds to the Press and place your Press on your scales, tare the Press to zero. To monitor heat place a thermometer in your Press. Now pour in the kettle's remaining 205-208 degree F water into the Press as shown on your scale (I use 870-900g in my 1 liter Press). Place the lid on the Press with plunger extended upward to begin the brewing cycle. Set your timer to 4 minutes. STIR, SINK, OR SCOOP OFF THE BLOOM. After after one minute, either gently stir, or sink the bloom with a spoon, or remove (break) the cake "crust" with a soup spoon (or two) to gently scoop to remove (clean) the bloom off the top to reduce the amount of fines in the brew. Be sure no grounds remain above the plunger or in the spout as those grounds will end up in your cup. REPLACE THE LID AND FINISH BREWING. With the lid on, continue to brew until the timer beeps, then press the plunger down VERY SLOWLY to the bottom (to reduce agitation of any fines present). Pour out the warming water from your cup(s), THEN pour in the hot coffee from the Press to replace it. Serve and enjoy. This is the ambrosia people are talking about...properly made French Press. Consider buying a grinder and grinding the beans as you need them. As soon as they are ground (at the supermarket), their flavour diminishes fast due to the increased surface area. That's why it smells so good when you grind them! Wouldn't you rather that flavour be in the coffee you brew? For french press, you can get away with using a cheap "whizzy" blade grinder like this one. For most other types of coffee, you should really use a conical burr grinder like this one, which makes for a more even grind and doesn't heat the coffee as it grinds. If you really want to geek out on this, read How to Use a Press Pot on CoffeeGeek. I've become such a coffe snob since using my French press about a year ago. It truly makes the best coffee. I grind the beans as fine as dust and then I wrap a paper towel (as a filter) around the screen before plunging. I steep for 5min and I check my water temp to between 195-200 Farenheit before adding it. Any hotter and it tends to burn the coffee. I have a $10 press I bought at IKEA and it works just fine, it gets a lot of use to. I used to use a coarser grind but the flavor is just not the same. Our press is a smaller version of yours, and we use 1 TB of whole beans for every 4 ounces of water. Our pot makes a maximum of 12 ounces. We have our own coffee grinder, a Black & Decker SmartGrind. There are no settings for the grind; it's a matter of holding down the button. I pulse the button about a dozen times, and that works well. When the coffee has turned out too weak, the problem has always been that I did not grind the coffee enough. I have not had a problem with too many fine grounds missing the filter. Just don't drink that last sip of coffee, and you'll be fine. I've been using a french press for a few months now, Bodum brand... the 'Brazil' model I think. Since I had read to use a coarse grind, that's what I've been doing, and it's worked well ('coarse' being what the coffee grinder at the store designates as 'coarse'). My Bodum Bistro grinder has a French Press setting which is all the way coarse. I've just brewed my best press pot yet (I'm a press pot newbie) with a grind two steps finer than that, a brew time of 4 minutes, using one rounded tablespoon of coffee per cup. This pot was very rich and satisfying. I saw your argument for not having a grinder and have to ask you to reconsider. Most people I know would agree that once you start grinding your own you can never go back to (even one day old) pre-ground. It is important to get a conical burr grinder. Yes, they're the '3rd' tier in terms of price, but through the years I've had blade and regular burr grinders and I can definitely say that the one I have now makes quite noticeably better coffee. The difference is in the consistency of the grind. Different brewing methods require different grind sizes and when the grains are all different sizes you don't get the benefits of the particular type of brew. For instance cappuccino requires that no large grains be present because they'll form channels in the 'puck' which allow steam to pass through too quickly. Similarly a drip process requires that no super-pulverized 'coffee dust' be present as this leads to bitterness. French pressed coffee is currently my favorite brewing method. I used to use a hario hand grinder but it was tough to dial it in and required a lot of elbow grease. I upgraded to a baratza encore and am pretty happy with it. It cost me $130 and I definitely noticed a difference in taste. My ideal coffee grind setting for this is 28. I actually recorded my process here, so please critique or let me know if you have any tips/advice to add, thx! I too have had poor success with coarse grinds. I've settled on telling the coffee-slave to grind it for a basket filter. Conical is too fine. Perc could also be successful. The larger grind, as I have observed, simply makes the french press easier to clean. The little grinds really get stuck at the bottom of the glass and it takes three or four rinses to get them all. With the larger grind, I get just as many grounds making it through the screen, but I can clean the press with just one rinse. You could try a grind for percolator. It is a little less coarse. If the coffee is being ground for you at a coffee shop or supermarket, my understanding is to ask for a No. 13 grind. Alternately, if you are grinding it yourself at the supermarket, set the grind for No. 13. Ground coffee begins to go stale within 30 seconds. My advice, purchase whole beans, get a grinder with a coarse setting, usually can find one for about $20, use about two tablespoons of beans for 8 ounces of coffee, as soon as the coffee finishes grinding pour it into the French press and give it a stir. Let it steep for about 4 minutes and youll see why French press is the way to go =). I work at a fairway coffee department. You would like to use number 13, which is French press, percolator basically. Type thick coffee, the less you go, the finer it is. I must add to this thread. Problems with other posts...letting your coffee sit for a long time is NOT a good option if you like hot coffee. Trying to get more flavor by sitting longer is a fail unless you like your coffee only warm. Fine grinds getting through the filter is not so much a problem nor is the pushing pressure. Get used to grinding your coffee just they way that allows for a firm pressure to squeeze the water through the grinds. I know that with my grinder, it is a 10 count to get the grind just right every day using the typical handheld spinning blade grinder. If you are worried about getting bitter flavors and like a robust flavor, do what I do... -Water from kettle just before boil begins (the loud bubbling becomes quite, but not a full boil) -Immediately pour the water into the press with the grounds in it already -If you use enough beans (I like it strong and perhaps use more beans than most), you can press immediately. Think about it. Typical coffee makers just pass water straight through the grinds without soaking for a long time. -Press the grinds and then immediately pour coffee into mug and carafe to keep hot. Afraid of grinds that may have passed through the filter...well then, use a paper filter to pour your coffee through to catch anything so small. Done. Strong, good tasting coffee, ground simply and fairly fine. Not bitter. Not Cold. Not the answer you're looking for? Browse other questions tagged coffee french-press or ask your own question. Is it normal that my coffee grinder leaves a huge mess all over the counter? Are these coffee beans unroasted?